Hypertext in XML is divided into multiple parts: XLink, XML Base, XPointer, and XInclude. XLink, the XML Linking Language, defines how one document links to another document. XML Base defines how the base URL of a document (against which relative URLs are resolved) is set. XPointer, the XML Pointer Language, defines how individual parts of a document are addressed. XInclude defines how one document can be built out of different pieces of other documents. An XLink points to a URI (in practice, a URL) that specifies a particular resource. If this URI is relative, the base URI can be established by an xml:base attribute. Relative or not, this URI may have a fragment identifier that more specifically identifies the desired part of the targeted document. When the URI points to an XML document, the fragment identifier is an XPointer. This chapter explores XLink and XML Base. The next two chapters explore XPointer and XInclude. The Web conquered the more established Ggopher protocol for one main reason: HTML made it possible to embed hypertext links in documents. These links could insert images or let the user jump from inside one document to another document or another part of the same document. To the extent that XML is rendered into HTML for viewing, the same syntax that HTML uses for linking can be used in XML documents. Alternate syntaxes can be converted into HTML syntax using XSLT. XSLT, including several examples of converting XML markup to HTML links, is discussed in Chapter 15. However, HTML linking has limits. For one thing, URLs are limited to pointing at a single document. More granularity than that, such as linking to the third sentence of the seventeenth paragraph in a document, requires you to manually insert named anchors in the targeted document. It cant be done without write access to the document to which youre linking. Furthermore, HTML links dont maintain any sense of history or relations between documents. Although browsers may track the path youve followed through a series of documents, such tracking isnt very reliable. From inside the HTML, theres no way to know from where a reader came. Links are purely one-way. The linking document knows to whom its linking, but the linked document does not know whos linking to it. XLink supports more powerful links between documents designed especially for use with XML. XLink achieves everything possible with HTMLs URL-based hyperlinks and anchors. Beyond this, however, it supports multidirectional links (where the links run in more than one direction). Any element can become a link, not just the A element. Links do not even have to be stored in the same file as the documents they connect. These features make XLinks more suitable not only for new uses, but for things that can be done only with considerable effort in HTML, such as cross-references, footnotes, end notes, and more. Only Mozilla and its derivatives (Netscape 6, Netscape 7, Galeon, Camino, Firebird, and so on) have any support for XLinks, and that support is incomplete. Internet Explorer 6.0, Opera 7.0, and Safari 1.0 and earlier have absolutely no support for any kind of XLink. There are no general-purpose applications that support arbitrary XLinks. Thats because XLinks have a much broader base of applicability than HTML links. XLinks are not just used for hypertext connections and embedding images in documents. They can be used by any custom application that needs to establish connections between documents and parts of documents, for any reason. Even when XLinks are fully implemented in browsers, they may not always be blue underlined text that you click to jump to another page. They can be that, but they can also be both more and less, depending on your needs. The xlink prefix must be bound to the http://www.w3.org/1999/xlink namespace URI. As usual, the prefix can change as long as the URI remains the same. The xlink prefix is customary, and should be used unless youve got a really good reason to change it. In this chapter, I assume that the prefix xlink has been bound to the http://www.w3.org/1999/xlink URI. Notice that the elements have semantic names that describe the content they contain rather than how the elements behave. The information that these elements are links is included in the attributes, not the element names. Attributes define the linking behavior. These three examples are simple XLinks. Simple XLinks are similar to standard HTML links, and are the only kind of link supported by todays web browsers, so Ill begin with them. Later, I talk about the more complex (and more powerful) extended links. In the preceding COMPOSER example, the xlink:href attribute defines the target of the link. The value of this attribute is the absolute URL http://users.rcn.com/beand/. This linking element describes a connection from the COMPOSER element in the current document with the content ""Beth Anderson"" to the remote document at http://users.rcn.com/beand/. 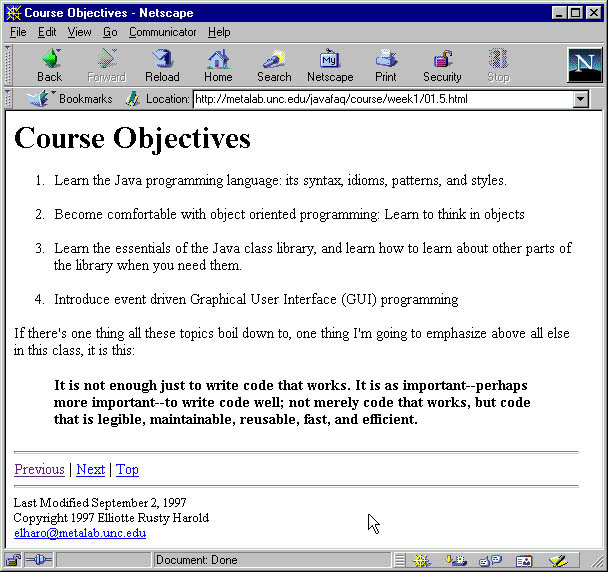 If you were to include this element in an XML document and load that document into an XLink-aware web browser, such as Mozilla or Netscape 6, the user could click on it to jump to the page http://users.rcn.com/beand/. The browser does not necessarily indicate this to the user by underlining it and coloring it blue, however. Visual formatting is still the province of a style sheet. Web documents that use XLinks will normally need CSS rules that use the :link and :visited pseudo-classes to specify how links are formatted. For example, these two rules attempt to duplicate traditional link formatting:. Youre, of course, free to choose other styles, though doing so might cause readers to miss your links. Its best not to change the link colors. You can also interpret this simple link more abstractly, as simply defining a one-way connection from one resource, the COMPOSER element, to another resource, the web page at http://users.rcn.com/beand/. Figure 17-1 diagrams this connection. This connection does not really imply any particular semantics or behavior. Its up to the application reading the document to decide what this abstract link means to it. In the FOOTNOTE example, the link target attributes name is xlink:href. Its value is the relative URL footnote7.xml. This describes a connection from the FOOTNOTE element in the current document with the content ""7"" to the document named footnote7.xml on the same server in the same directory as the document in which this link appears. In the third example above, the value of the xlink:href attribute is the relative URL logo.gif. The scheme, host, and directory of the document are copied from the scheme, host, and directory of the document in which the link appears. However, this element requests slightly different behavior. Instead of waiting for the user to activate the link, the xlink:actuate attribute asks that the link be activated automatically as soon as the document is loaded. The xlink:show attribute requests that the result be embedded in the current document instead of replacing the current document. <IMAGE ALT="Cafe con Leche Logo of a coffee cup"
In fact, a linking element might even have children that are themselves linking elements! That is, a linking element may contain another linking element or elements. This doesnt have any special meaning. As far as links go, each linking element is treated in isolation. Both the role and title describe the remote resource, not the local element. The remote resource in the preceding example is the document at http://www.google.com/advanced_search. Its not uncommon, though its not required, for the valuer of the xlink:title attribute to be the same as the contents of the TITLE element of the page to which you are linking. Alternately, you could use the URL for the HTML MIME media type, http://www.isi.edu/in-notes/iana/assignments/media-types/text/html, the URL for the XHTML namespace, http://www.w3.org/1999/xhtml, or the URL for the HTML 3.2 DTD, http://www.w3.org/TR/REC-html32#dtd. You could even use a mailto URL giving the e-mail address of the person who wrote the page. Other values are possible. XLink does not define any rules for how applications should interpret the value of an xlink:role, beyond simply stating that it must be an absolute URI. XLink does not define the user interface by which link roles and titles are presented to users. For example, Mozilla shows the user the title of the link in a Ttool Ttip when the cursor is hovering over the link, and does nothing with the role. A different application might choose to put the title in the status bar of the browser window, or do both, or neither. How or whether any particular application makes use of the role and title is completely up to it. The xlink:show attribute suggests how the content should be displayed when the link is activated;, for example, by opening a new window to hold the remote resource or by loading the remote resource into the current window. The xlink:actuate attribute suggests when the link should be activated; for instance, as soon as the document is loaded, or only after a specific user request. Behavior is application- dependent, however, and applications are free to ignore the suggestions. Check this out, but don't leave our site completely! This is a link, but whats at the end of the link does not replace the existing document; it does not embed itself into the existing document; it is not displayed in a new window. In XML documents, you might agree that this behavior was implied whenever a STYLESHEET element was encountered. Because this is not one of the three predetermined link behaviors, youd set xlink:show to other. Finally, you can set xlink:show to none to indicate that the document contains no information to help the application decide what, if anything, to do with the link. Its completely up to the application reading the document to make its own choices. Regardless of what behavior xlink:show suggests, the browser or other application reading the document is free to do whatever it wants when the link is activated, including nothing at all. For example, a browser with ""Automatically load images"" turned off might well choose to ignore xlink:show="embed". xlink:show (new | replace | embed) #IMPLIED "replace"
This particular DTD fragment doesnt allow the xlink:show attribute to have the value other or none. Thats OK, too. Not all linking elements necessarily support all possible values of xlink:show. Finally, setting xlink:actuate to none leaves it completely up to the application to decide when or if to traverse the link. xlink:show    (new | replace | embed) #IMPLIED "embed"
This particular DTD fragment doesnt allow the xlink:actuate attribute to have the values onRequest, other, or none. Thats OK, too. Not all linking elements necessarily support all possible values of xlink:actuate. Simple links behave more or less like the old-fashioned links youre accustomed to from HTML. A simple link connects one element in the linking document to one target document. Furthermore, the link is one-way, from the source to the target. Extended links, however, go substantially beyond HTML links to include multidirectional links between many documents and out-of-line links. An extended link consists of a set of resources and a set of the connections between them. The resources may be local (part of the extended link element) or remote (not part of the extended link element, and generally, though not necessarily, in another document). Each resource may be either a target or a source of a link or both. If a link does not contain any local resources, only remote resources, its called an out-of-line link. In computer science terms, an extended link is a directed, labeled graph in which the resources are vertices and the links between resources are edges. Thought of abstractly like this, an extended link is really just an XML format for a directed graph. The tricky part comes in deciding exactly what any particular application is supposed to do with such a data structure. For now, I can only speculate about what applications might do with extended links and what sort of user interfaces they might provide. Extended links generally point to more than one target and from more than one source. Both sources and targets are called by the more generic name resource. In fact, whether a resource is a source or a target can change depending on which link is being followed and in which direction. Resources are divided into remote resources and local resources. A local resource is actually contained inside the extended link element. It is the content of an element of arbitrary type that has an xlink:type attribute with the value resource. A remote resource exists outside the extended link element, very possibly in another document. The extended link element contains locator child elements that point to the remote resource. These are elements with any name that have an xlink:type attribute with the value locator. Each locator element has an xlink:href attribute whose value is a URI locating the remote resource. The terminology is unnecessarily confusing here. Both xlink:type="locator" and xlink:type="resource" elements locate resources. An xlink:type="locator" element locates a remote resource. An xlink:type="resource" element locates a local resource. Personally, I think xlink:type="local" and xlink:type="remote" would be better choices here; but xlink:type="resource" and xlink:type="locator" are what the standard has given us. Figure 17-2 shows the WEBSITE extended link element and five resources. The WEBSITE element contains one resource and refers to the other four by URLs. However, this just describes these resources. No connections are implied between them. 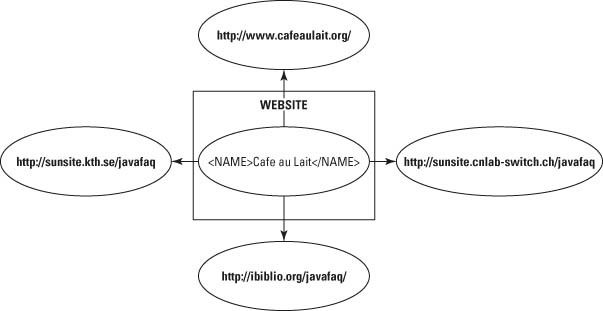 xlink:title="Cafe au Lait U.S. Mirror"
Each of these possible paths between resources can have different rules for when the link is traversed and what happens when its traversed. These potential traversals are called arcs, and they're represented in XML by elements that have an xlink:type attribute with the value arc. Traversal rules are specified by attaching xlink:actuate and xlink:show attributes to arc elements. These attributes have the same values and meanings as they do for simple links. Applications can use arc elements to determine which traversals are and are not allowed and when a link is traversed. An arc element also has an xlink:from attribute and an xlink:to attribute. The xlink:from attribute says which resource or resources the arc comes from. The xlink:to attribute says which resource or resources the arc goes to. They do this by matching the value of the xlink:label attributes on the various resources in the extended link. Each xlink:label should contain an XML name token. For example, if the xlink:from attribute has the value A, and the xlink:to attribute has the value B, the arc goes from the resource whose xlink:label has the value A to the resource whose xlink:label has the value B. Listing 17-3 demonstrates with labels that contain two-letter country codes and state abbreviations mapped to the geographic location of each resource. The first CONNECTION element in the preceding listing defines an arc from the resource with the label ""source"" to the resource with the label ""ch."" The second CONNECTION element defines an arc from the resource with the label ""source"" to the resource with the label ""ny,"" and so on. Figure 17-3 diagrams this link with ovals representing the resources and arrows representing the arcs. This is the same as Figure 17-2, but now connections have been added between resources, as specified by the arc elements. Here, the ""mirror"" label is shared by three different elements, and the single arc element defines three arcs: oOne from the source to the Swedish mirror, one from the source to the Swiss mirror, and one from the source to the U.S. mirror. Figure 17-4 diagrams this. 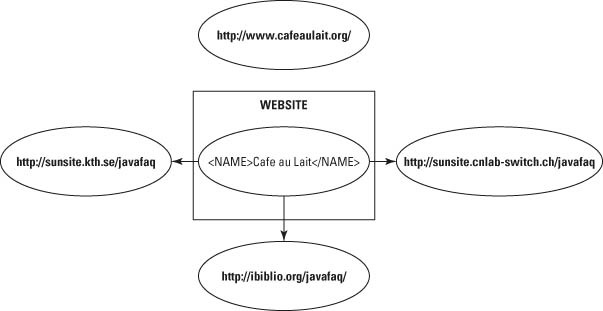 Its very similar to Figure 17-3 except that the link between the NAME element and the home site at http://www.cafeaulait.org/ is missing. Because the HOMESITE has a different label, it isnt connected by the single arc element. Although I dont recommend it, you can omit either the xlink:from attribute, the xlink:to attribute, or both from an arc element. In this case, all resources participating in the link, both local and remote, take the place of the missing attribute. For example, consider the WEBSITE element in Listing 17-5. Its single arc element is missing the xlink:to attribute. Consequently, this extended link includes five arcsone from the source to us, three from the source to each of the mirrors, and one from the source to itself. All arcs start at the NAME element because the xlink:from attribute is present and so specifies. Figure 17-5 diagrams this. Its very similar to Figure 17-3 except that theres now an extra circular arc from the NAME element to itself. As usual, to be valid, all the attributes and elements must be fully declared in the documents DTD. Listing 17-6 is a DTD fragment that describes the preceding WEBSITE element. xlink:actuate (onRequest | onLoad) #IMPLIED "onRequest"
Inline links, such as the familiar A element from HTML, are themselves part of the source or target of the link. Generally, they link from the document that they're part of to some other document. However, they can also link to a different part of the same document. The source of the link, that is the blue underlined text, is included inside the A element that defines the link. Most simple links are inline. Extended links can also be out-of-line. An out-of-line link does not contain any part of any of the resources it connects. Instead, the links are stored in a separate document called the linkbase. For example, you might use a linkbase to maintain a slide show where each slide requires next and previous links. By changing the order of the slides in the linkbase, you can change the targets of the previous and next links on each page without having to edit the slides themselves. Out-of-line links also allow you to add links to and from documents that cant be modified, such as a page on someone elses web site. For example, media watchdog groups, such as FAIR (http://www.fair.org/) and AIM (http://www.aim.org/), could put out-of-line links from the New York Times editorial page to analyses of those editorials. The links would only be visible to users who loaded the right linkbase, however. Finally, out-of-line links allow you to add links to different parts of non-XML content. For instance, you could link to the third minute of a QuickTime movie, even though the movie doesnt contain any attributes or elements that would normally be used to identify the linked position. For example, a list of mirror sites for a document, such as Listing 17-5, might be stored in a separate file on a web server in a known location where browsers can find and query it to determine the nearest mirror of a page they're looking for. The out-of-lineness, however, is that this element does not appear in the document from which the link is activated. This expands the abstraction of style sheets into the linking domain. A style sheet is completely separate from the document it describes, and yet provides rules that modify how the document is presented to the reader. A linkbase containing out-of-line links is separated from the documents it connects, yet it provides the necessary links to the reader. This has several advantages, including keeping more presentation-oriented markup separate from the document and allowing the linking of read-only documents. I feel compelled to note that application support for out-of-line links is at best hypothetical at the time of this writing. Although I can show you how to create such links, their actual implementation and support is almost certainly some time away. Some of the details remain to be defined and likely will be implemented in vendor-specific fashions, at least initially. Still, they hold the promise of enabling more sophisticated linking than can be achieved with HTML. 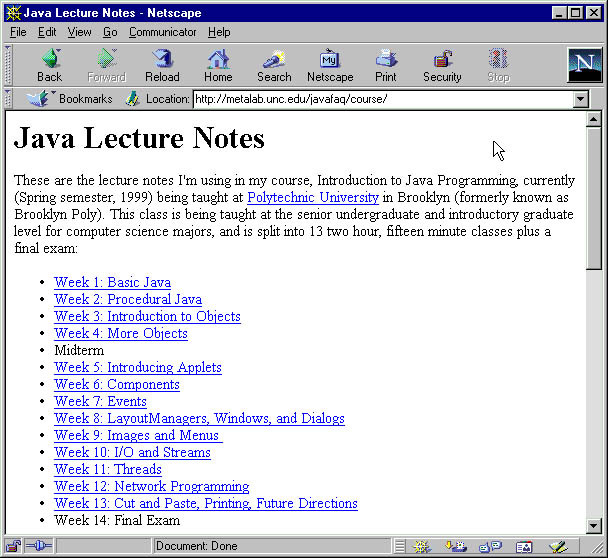 For example, Ive put the notes for a Java course I teach on my web site. Figure 17-6 shows the introductory page. This particular course consists of 13 classes, each of which contains between 30 and 60 individual pages of notes. A table of contents page for each class is then provided that links to each note page used in that class. Each of the several hundred pages making up the entire site has links to the previous document (Previous link), the next document (Next link), and the table of contents (Top link) for the week, as shown in Figure 17-7. Putting it all together, this amounts to more than a thousand interconnections among this set of documents. Figure 17-6: The introductory page for my class web site shows 13 weeks of lecture notes. The possible interconnections grow exponentially with the number of documents. Every time a document is moved, renamed, or divided into smaller pieces, the links need to be adjusted on that page, on the page before it and after it in the set, and on the table of contents for the week. Quite frankly, this is a lot more work than it should be, and it tends to discourage necessary modifications and updates to the course notes. The sensible thing to do, if HTML supported it, would be to store the connections in a separate document. Pages could then be reorganized by editing that one document. HTML links dont support this, but extended XLinks do. Listing 17-7 demonstrates one such document. This document describes links from the main index page to the individual classes and vice versa. Listing 17-8 demonstrates another possible out-of-line extended link. This one provides previous and next links between the 13 classes. Now the topics can be reordered simply by rearranging whats connected to what in the out-of-line extended link. The course notes themselves dont have to be touched. However, a couple of pieces are missing from this puzzle. The first is some notion of how or where in the individual week documents the links will be displayed. It would be easy enough to add <PREVIOUS/> and <NEXT/> tags to the individual week pages. The XPointers youll learn about in the next chapter would allow you to select these elements in particular as the sources of outgoing links rather than the entire document. A single XML document may contain multiple out-of-line extended links. Listings 17-7 and 17-8 could be combined into a single document. However, the XLink specification is relatively silent on exactly what the format of such a compound document should look like. About all it says is that such a document must be a well-formed XML document. An XLink processor would presumably read the entire document and extract and store any extended links it found there. The final thing thats missing is some way for a browser or other application thats reading the individual pages to be informed that there is a separate linkbase elsewhere that it should read and parse so that it can show the links to the user. This is probably the area in which the specification is weakest. Ideally, it would be handled through some external mechanism such as HTTP headers. However, the only currently defined way to do this (which still isnt supported by any browsers or other software) is to add an extended link inside the documents the out-of-line link connects. Of course, the problem with this approach is that it requires you to modify the documents before you can link them. At least in this case, however, it might be enough for the browser to load one such document to find the linkbase, so you may not need to modify every document the linkbase connects. Documents on the Web have an annoying tendency to move. Authors edit pages on their local systems or staging servers before uploading them to the server. Readers save copies on their hard drives. Fans make copies of entire sites, both licit and illicit. Google caches almost the entire Web on its servers. Given this, authors really cant assume that readers get documents from the place the authors put them. Its entirely possible that a document will be somewhere else. For example, I used AltaVista to search for a phrase in a document I published on my web site and found it had somehow duplicated itself onto 12 different servers in five different countries, my copyright notices notwithstanding. Given all this and more, using relative URLs in a wWeb document is a little risky; and thats true whether the URLs are stored in HTML, XML, XHTML, XLinks, XPointers, XInclude, RDF, schemas, RDDL, or any of the other myriad languages that somewhere contain URLs. HTML solves this problem by allowing an empty BASE element in the HEAD that identifies the base URL via an HREF attribute. For example, Listing 17-9 is a very simple home page for a fictional San Francisco plant nursery called Gods Green Earth. This page is normally found at http://www.geocities.com/godsgreenearthsf/. Because of the BASE element in the HEAD, it has the base URL http://www.geocities.com/godsgreenearthsf/ even if you load it from a copy saved on your local hard drive. The logo image is loaded from GeoCities, even if the page has been moved to a different server. Links that point to relative URLs are relative to http://www.geocities.com/godsgreenearthsf/. Indeed, anything in this page that uses a relative URL will be loaded from http://www.geocities.com. The first URL in this list comes from GeoCities, but not from the godsgreenearthsf directory, because the relative URL in the IMG element begins with a forward slash and therefore starts from the root of the Web web server. Its relative to the host but not the directory. The remaining four URLs do not begin with a forward slash and all are loaded from the godsgreenearthsf directory on www.geocities.com. Similar approaches work in XHTML, but in most XML-based vocabularies, theres no convenient place to put a BASE element. The BASE element could even be needed for something else entirely, such as the location of a military base or the length of the base of a triangle. 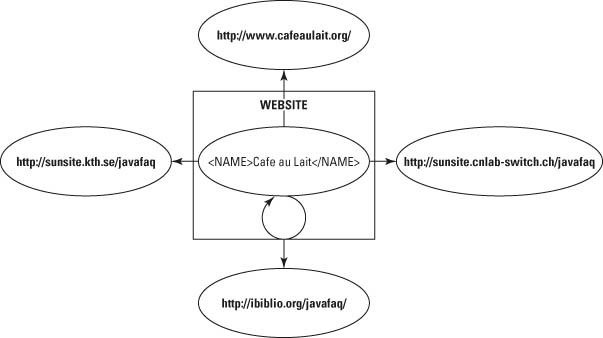 Instead, in XML, you can use an xml:base attribute to establish a base URL. The value of this attribute contains the base URL for that element and all its descendants. For example, Listing 17-10 also has the base URL http://www.geocities.com/godsgreenearthsf/. There are five XLinks in this document. Each XLink contains a relative URL, and each is relative to http://www.geocities.com/godsgreenearthsf/. Again, anything in this page that uses a relative URL will be loaded from http://www.geocities.com no matter where the page itself is found. In Listing 17-10, all the URLs the base is attached to are in XLinks. The xml:base attribute is more general than that, however. It also applies to URLs found in XInclude include elements, processing instructions, W3C Schema Language schemaLocation attributes, and more. The one common kind of URL that xml:base does not apply to is the namespace URL. xml:base attributes are not considered when processing a namespace URL, even a relative one. However, relative namespace URLs are highly discouraged, and you should not use them in your own work, so this shouldnt be much of an issue in practice. Most authors dont bother to declare it. In this position, it only applies to the PRODUCT links. It does not apply to the LOGO link. The logo URL /clipart/m/s/appleblossoms.gif is now relative to the physical location of this document. A different image will load if you pull it in from a local drive than from one on a remote web server. There can even be multiple xml:base attributes on different elements in the document, so that different elements are relative to different URLs. If an element has multiple ancestors with xml:base attributes, the closest one takes precedence. Consider Listing 17-12. Here the root element sets the base URL to http://www.geocities.com/godsgreenearthsf, and the PRODUCTS element sets the base URL to http://www.seedgrow.com. On occasion, it might be useful to use relative URLs in xml:base attributes. In this case, that URL is itself relative to the URL of the closest ancestor with an xml:base attribute. If there is no such ancestor, the URL is relative to the actual URL of the document. For example, Listing 17-13 sets the base URL of the root element to http://www.geocities.com/godsgreenearthsf/ as before. However, an xml:base attribute on the PRODUCTS element sets the base URL to products. The disadvantage to the element-wide scope of xml:base, as opposed to the document-wide scope of the BASE element in HTML, is that the base URL can never be applied to things outside the root element. Specifically, it does not change the location of a style sheet referenced in an xml-stylesheet processing instruction. For example, consider Listing 17-14. The browser will look for the document business.css in the same directory in which it found the XML document, regardless of what xml:base says. Likewise, xml:base has no effect on URIs used inside DTDs and document-type declarations, whether in the internal or external DTD subsets. XLinks can do everything HTML links can do and quite a bit more, but they arent well supported by current applications. XLink elements are all defined by attributes attached to the existing elements in other XML applications. XLink attributes of all types are placed in the http://www.w3.org/1999/xlink namespace, normally with the xlink prefix. Simple links behave much like HTML links, but they are not restricted to a single <A> tag. XLink elements are identified by xlink:type attributes. Simple link elements are identified by xlink:type attributes with the value simple. Simple link elements have an xlink:href attribute whose value is the URI the link points to. Linking elements can describe the resource theyre linking to with xlink:title and xlink:role attributes. The value of the xlink:role attribute must be a URI. Linking elements can use the xlink:show attribute to tell the application how the content should be displayed when the link is activated, for example, by opening a new window. Linking elements can use the xlink:actuate attribute to tell the application whether the link should be traversed without a specific user request. Extended link elements are identified by xlink:type attributes with the value extended. Extended links can contain multiple locators, resources, and arcs. Local resource elements are identified by xlink:type attributes with the value resource. The resource is the content of the resource element. Remote resource locator elements are identified by xlink:type attributes with the value locator. A locator element has an xlink:href attribute whose value is the URI of the resource it locates. Both resource and locator elements have an xlink:label attribute that contains an XML name token as a label for the resource. Arc elements are identified by xlink:type attributes with the value arc. Arc elements have xlink:from and xlink:to attributes that identify the resources they connect by their labels. Arc elements may have xlink:show and xlink:actuate attributes to determine when and how traversal of the link occurs. An out-of-line link is a link that does not contain any local resources. A linkbase is a document containing one or more out-of-line, extended link elements. A linkbase is found when a document with an extended link whose xlink:arcrole has the value http://www.w3.org/1999/xlink/properties/linkbase is read. An xml:base attribute on any element sets the URL against which relative URLs in that element and its descendants are relative. In Chapter 18, you learn how you can use XPointers to link not only to remote documents, but also to very specific elements in remote documents. From XML 1.1 Bible, by Elliotte Rusty Harold. © 2004 by Wiley Publishing, Inc. All rights reserved. Reproduced here by permission of the publisher.